Hearing loss is a common health condition that affects millions of Americans in all age groups and occurs when any part of the ear is not working the way it should. There are different types of hearing loss with many different causes. Just like vision, hearing ability and loss levels will be unique in every person. Depending on the cause, the loss may not be reversible. Knowing about your type of hearing loss is the key to treating it successfully and improving your hearing. The most common causes of hearing loss are age and exposure to harmful noise levels. However, many types of hearing loss can also occur as a result of infection during gestation, infection of the middle ear, head injury, perforated eardrum, some cancer treatments and certain medications. This occurs when the ear canal, eardrum or middle ear have a problem conducting sound, which is often caused by a blockage and prevents sound from traveling through the ear. Causes include structural deformities, excess fluid in the middle ear, ear infections, allergies, earwax, eardrum perforations, foreign objects, otosclerosis and benign tumors called acoustic neuromas. 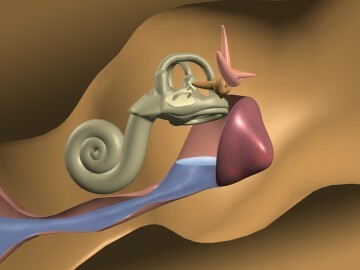 Conductive hearing loss is often treatable with surgery or medication. This occurs when the ear has a problem sensing sound. It is often associated with problems affecting the inner ear when sensory cells or nerve fibers are damaged, which inhibits the transmission of information to the brain. It is also called “nerve deafness.” Causes include natural aging, noise exposure, injury, malformations of the inner ear, viruses, autoimmune disorders, otosclerosis, Meniere’s disease tumors. Sensorineural hearing loss is most often treated with hearing aids. This is a combination of both sensorineural and conductive hearing loss. There could be damage to the outer, middle or inner ear. If you or someone you care for is experiencing hearing loss, please contact us at (858) 279-3277 to schedule an appointment.